Thank you for considering Key Modular Homes as the builder and general contractor of your new home. 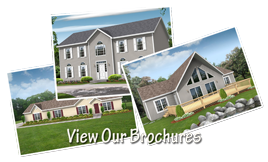 We are a division of Ferrera Development Corp., and one of the most successful and respected home builders in New York State. Our success is due, in part, to our hundreds of satisfied customers referring us to their friends and relatives year after year. Our marketing, production, service, and management staff is well trained and highly professional. In addition, we have a core group of subcontractors, many of which have been with us for 15+ years. All of our subcontractors have been handpicked based on their craftsmanship and integrity. We have also developed successful working relationships with several local and regional banks. Their mortgage specialists routinely come to our office to meet with customers in order to expedite the application and approval process. Key Modular Homes takes great pride its service reputation. Supported by our full time Service Manager, we have a comprehensive warranty backed by our own in house service department. Since 1979 we have been constructing quality homes for hundreds of satisfied customers. Our fine reputation is a reflection of our commitment to quality and our ability to provide a home our customers are proud to own. Thank you again for allowing us the opportunity to serve you and your housing needs.